In contrast to the grueling night bus to Arequipa, the journey to Chivay (the tiny town that has been our base to see the area) was in a private vehicle and took us round winding mountain roads, past agricultural zones and active volcanoes, and through post-rainy-season lush green plains. We stopped a few times on the journey. 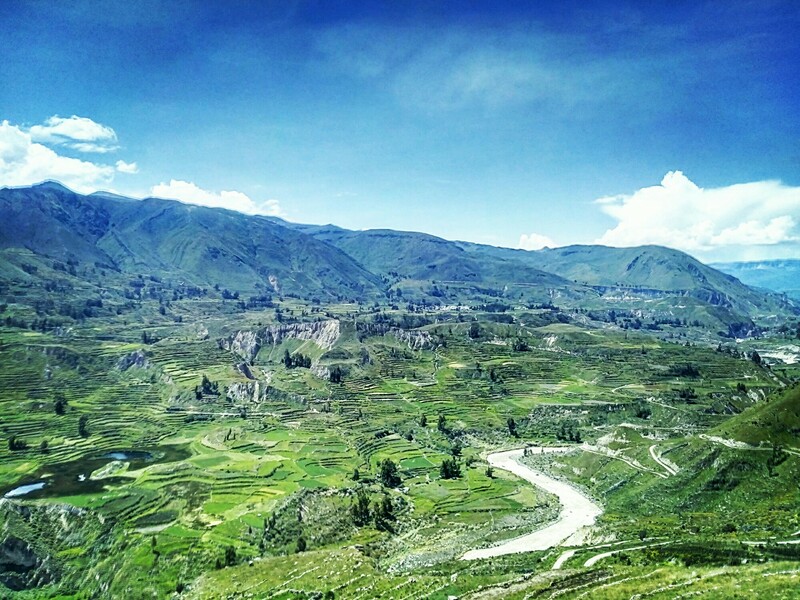 The first time was in our first experience of a true Andean village. It was quite literally just a couple of ramshackle but cheerful and colourful houses set just off the main road, but the women in their gorgeous traditional dress welcomed us and some of us bought a mate Inka from a small cafe and drank it in the sun. The people in these mountainous regions in particular are very into their medicinal herbs and this particular tea has a bit of everything, for altitude, colds and tummy sickness. Not sure how effective it was but it was quite bemusing to have to hold back twigs and leaves with the spoon while drinking and it was warm at least! 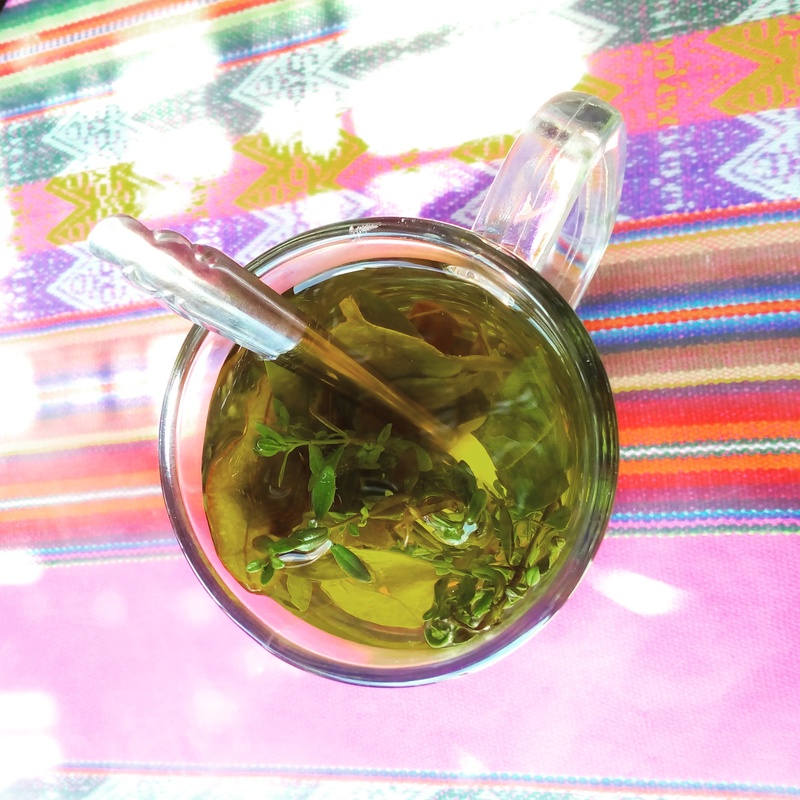 It was a step up from my mate coca (coca leaf tea – sans cocaine despite being the source) the previous night which had an extra special ingredient: bird poo on the leaves! I told the waiter and he said in Spanish, well yes it’s ocra, very good for you. 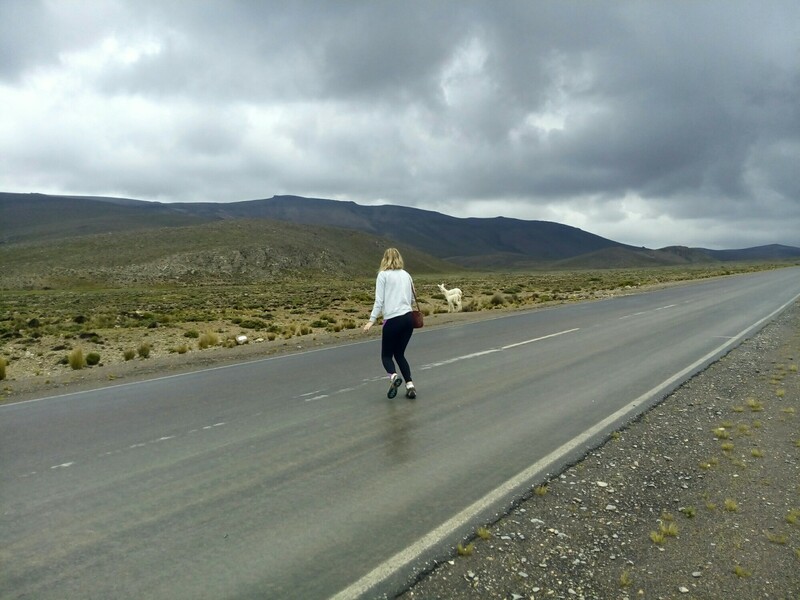 Anyway, we continued on with our bus journey and passed through plains full of wild vicunyas, llamas and alpacas. We were able to get off the bus and take plenty of photos. I couldn’t get enough of them, they just seem to all have such a sweet and quizzical expression… Much nicer than the camels I encountered in Morocco! We also saw a baby llama not even two weeks old which apparently is very unusual to see. We stopped for lunch and had a wide array of Peruvian food choices in the form of a buffet. Then finally onto Chivay, where we would spend 2 nights (very nice after being on the move for almost a week). Chivay is just tiny and the walking tour took all of 20 minutes to see it! 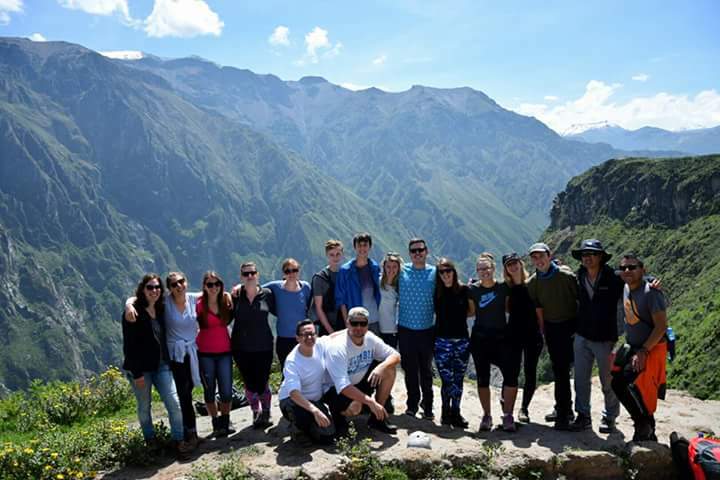 But it’s very interesting to see how the people up here live and it was a great base for our main activity here, which we just did today – visiting the Colca Canyon to hike around the area and see Peru’s most famous animal, the condors. We got up early to get to the Canyon and it was around 2 hours drive including some stops looking out over the surrounding valleys. April is by far the best time to come as rainy season has just finished so everything is so green and the many farming terraces and other fields are fully visible. The whole area is like some kind of massive green and yellow patchwork quilt laid out over a mountainous landscape and it was truly beautiful. 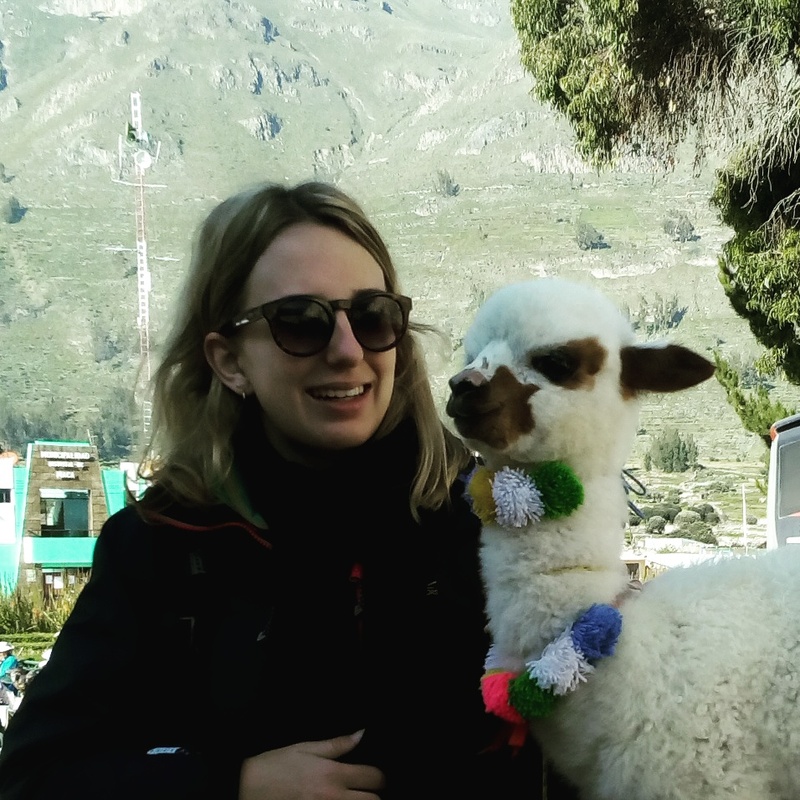 We saw quinoa, potato and corn al growing, their areas marked out with piled up stones, plus plenty of cows and alpacas grazing along the slopes. We also stopped at Maca village where we saw the church, an interesting combination of local heritage and strong Catholicism I would say. There were also women in traditional dress waiting around with their animals so you can give a sole or two for a photo. I couldn’t resist meeting this cheeky chappy – his name is Pepe and just 3 weeks old. His fur was so so soft and he was very tame and cuddly. Finally we got to the Canyon and spent a fair while watching the condors. 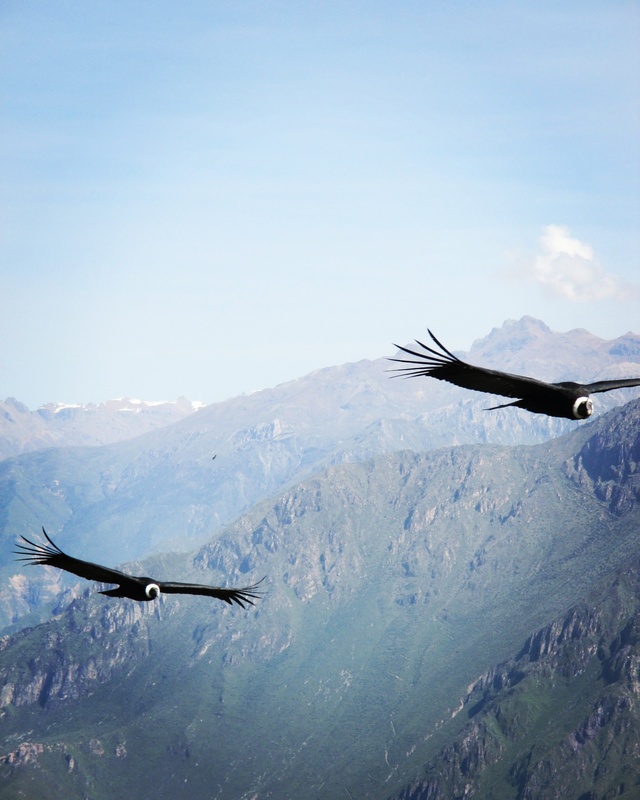 We were so lucky with the weather as there has to be a wind but also sun for the thermal currents which carry the condors as they glide, and then also no clouds so that you can see them. We had perfect conditions so saw lots! They are absolutely huge with a wing span of around 3 metres on average and some came very close. I got a couple of good photos I was happy with! Then a hike along the canyon itself which was well worth doing to adjust to the altitude (hard to breathe at times I must admit) before we head to Cusco but also because the scenery is so dramatic and beautiful. It was tiring though especially with the altitude. But good prep for the Inca trail which is fast approaching?! In the afternoon, we came back to Chivay and went to some nearby hot springs. Since there were heavy rains recently the river is overflowing and very dirty so we didn’t go in the natural pools which was a shame, but we did go to a man-made pool using the volcanic springs for a naturally hot swimming area. It was incredibly relaxing and we were surrounded once again by great scenery which helped! Very tired now writing this though – it’s been a busy day and tomorrow will be a lot of bus since we go back to Arequipa, have the afternoon there then another night bus to the Incan capital – Cusco.